Most of my yarn is hand dyed or handspun and so it tends to need winding into balls before it can be used, but even when I buy ready-balled yarn it is typical for me to re-wind it into a centre-pull ball. Someone recently asked me why I go to this trouble which makes me think this post is over-due. There are many reasons to wind yarn in such a way that it can be used from the inside of the ever-decreasing ball, these range from the purely practical to the more scientific. It doesn't roll around when you pull working yarn from the ball - this is especially useful if you have a cat, dog or small child prone to chasing colorful things that move across the floor. The above point instantly makes your project more portable - you can pop the yarn in a pocket or bag and work from it very easily. Commercially wound balls can sometimes collapse when only a small proportion has been used, resulting in a great big tangle (and a high probability of profane language) and requiring more time and patience than I have. When winding the yarn before using it, one has the opportunity get to know it and what to expect so there are no surprises mid-project. It's possible to see how the colour changes work, whether there are any unwelcome knots or joins and how it might be best used for the planned project - one end of the yarn may look nicer than the other if used to cast on, etc. Wool can stretch, so if a ball is wound tightly before knitting, and is then used from outside of the tightly wound ball, it may relax after washing.... resulting in shrinkage! Pulling from the centre of the ball means the yarn is given a chance to relax before being used*. That's really all there is to it. If you have any other benefits that I've missed from the list, or any other tips you'd like to share on this topic, please leave a comment. *This is one of the many tips I picked up from Elizabeth Zimmerman's 'Knitting Workshop'. It's like you have read my mind! I've been researching mechanical winders vs. nostepinnes this weekend. Right now, I mainly get my yarn wound at the yarn store or wrap it around my fingers, but I'm ready for an upgrade. I think I'm going to start with a nostepinne. Thanks for the review! 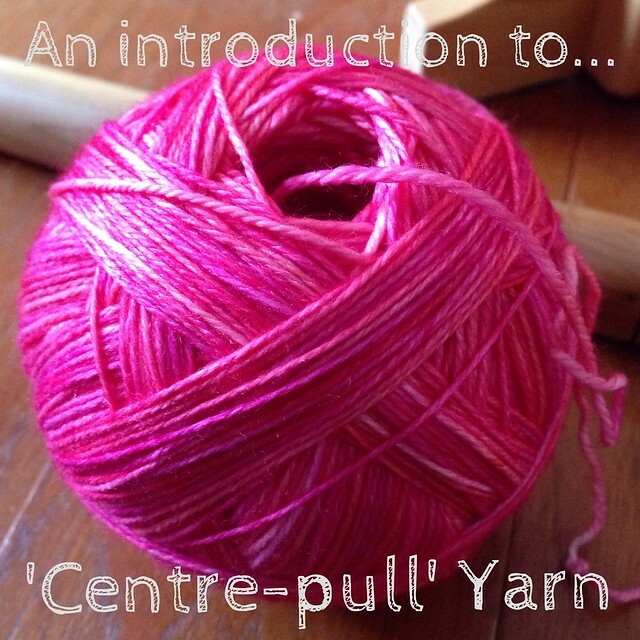 I've never thought of how center pull balls allow the yarn to relax, interesting! I like using a nostepinne. I kept breaking my knitpicks ball winder but sometimes I need something faster than hand winding, so I recently bought a Royal winder and like it very much. I've recently wound a hand dyed hank into a centre pull ball, definitely much nicer to crochet from.....no more chasing the ball around! Valid point on already wound balls. They do get tangled toward the end. I wind my center pull balls usually by ball winder but if I do it by hand, I just did cross like wraps. I didn't know to turn a bit every wrap. Learned something new. Thanks for posting. Also, what do you do with the loose end on the outside of the ball?